"Tell me what it felt like… to be famous!" 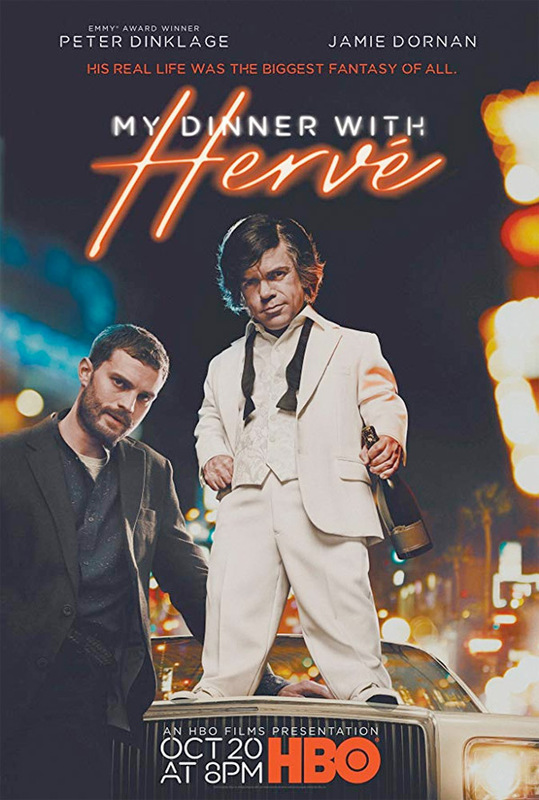 HBO has debuted the full-length trailer for their feature film My Dinner with Hervé, starring the immensely taelnted Peter Dinklage as the famous French dwarf actor Herve Villechaize, who many will recognize from either The Man with the Golden Gun (as Scaramanga's little henchman Nick Nack) or "Fantasy Island" (as Tattoo). The story is about an evening in Los Angeles in which struggling journalist Danny Tate, as played by Jamie Dornan, is sent to meet and interview Herve. This really happened and, as the story goes, it was "an encounter that will have life-changing consequences for both." You can get a glimpse of that in this trailer. The cast includes Andy Garcia, Mireille Enos, Oona Chaplin, Helena Mattsson, and Harriet Walter. This really looks quite good, I'm pretty excited to watch once it's out. Dinklage really seems to be giving his all playing Herve in this great role. Check it out. You can still watch the original teaser trailer for Gervasi's My Dinner with Hervé here, for the original intro. Inspired by a real story, HBO's My Dinner with Hervé explores the unlikely friendship between struggling journalist Danny Tate (Jamie Dornan) and Herve Villechaize (Peter Dinklage), the world's most famous knife-wielding French dwarf actor, as it unfolds over one wild night in Los Angeles -- an encounter that will have life-changing consequences for both. My Dinner with Hervé is directed by award-winning English filmmaker Sacha Gervasi, director of the documentary Anvil: The Story of Anvil plus the films Hitchcock and November Criminals previously, who is also a taletned screenwriter (The Big Tease, The Terminal, Henry's Crime). The screenplay is also written by Sacha Gervasi, based on a story by Sean Macaulay and Sacha Gervasi. This hasn't premiered at any film festivals or otherwise yet. HBO will release Gervasi's My Dinner with Hervé exclusively starting October 20th late next month. How does it look? Still interested?